The third entry in the series of spectacular action games with Batman. It was developed by WB Games Montreal (which previously prepared the Wii U port of Batman: Arkham City) and published by the Warner Bros. company. 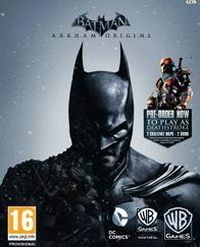 “Batman: Arkham Asylum” (2009) and “Batman: Arkham City” (2011) created by Rocksteady, a series of action games with Batman conquered the list of bestsellers and has become one of the key brands in the portfolio of Warner Bros. Interactive. When deciding about the third game, the publisher has taken a bold step entrusting it to in-house WB Games Montreal studio. The plot of “Batman: Arkham Origins” precedes previous games. The sources of inspiration were comics such as “Batman: Year One” and “Legends of the Dark Knight”. The action starts on Christmas Eve, a few years before the events presented in “Batman: Arkham Asylum”. Batman has just started his superhero career, buy one of the most feared villains in Gotham City, Black Mask has set a reward for his head. Batman must confront villains hunting for him and discover why someone wants him dead. The screenwriters try to clearly explain the intricate relationships between Batman and other characters known from earlier installments of the series. Of course the game could not miss the all-new characters, including extremely dangerous ones such as Deathstroke, Shiva or Firefly. The dynamic gameplay resembles action games, mainly due to TPP view. Developers of WB Games Montreal kept the mechanics of “Batman: Arkham City”. However, younger and less experienced Batman does not fight perfectly and has to master some skills. He can use new gadgets, including Remote Claw – a rope to pull two objects (or enemies). One of the most important new features is The Dark Knight system introducing the challenges directly into the gameplay. Developers kept modes such as Predator or Challenges known from the previous games and dynamically generated events and side missions (examining crime scenes, ruining plans of criminals, etc.) that help Batman improving his reputation among the citizens of Gotham. Compared to the previous games, “Batman: Arkham Origin” offers much larger locations comprised of two districts: Old and New Gotham. Moving between locations is easy due to a plane called Batwing. As in previous games, Batman can enter numerous buildings visiting, e.g. a police station, a bank office or a luxury hotel. “Batman: Arkham Origins” runs on modified version of Unreal Engine 3 applied to “Batman: Arkham City”. It provides high-quality audiovisual layer. This unofficial guide for Batman: Arkham Origins includes, first of all, a very detailed walkthrough for the main single-player storyline.